Just in case folks are looking for something a little unique to do this weekend, I'd like to suggest C-Cafe's Sunday Organic Buffet. It's all-you-can-eat all-organic all-local food for the lovely price of 1,000yen, and I promise you won't be disappointed. Feast on seasonal dishes of extraordinary flavor and creativeness, and please don't forget to try the curry. It's seriously one of the most wonderful things I've ever eaten, and that includes my mother's meatloaf as well as her coffeecake. I'd also recommend wearing something with a comfortable waistband. It's that good. 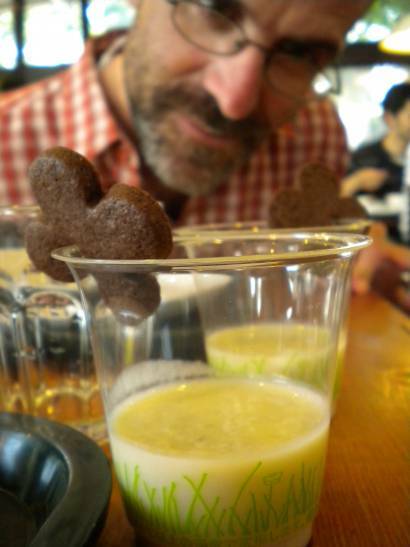 Photo Note: A close-up of Silent Cafe's banana milk and perfectly sweet cookies. More yumminess! Oh this sounds absolutely DELICIOUS!!! It is, and I miss it so! I'm looking forward to attending October's.